If I did It...I'd be Crazy to Tell You? I just couldn't resist typing the title of this post. Of course, I am referring to the controversy surrounding the recent non-fiction title If I Did It: Confessions of the Killer by the Goldman Family. This is the confession of all confessions--if it's true. Or a warped piece of creative fiction, if it isn't. Eric Kampmann, publisher of what many seem to be calling "the O.J. book", spoke tonight at the Express Yourself...Authors' Conference held at the Sheraton Park Ridge Hotel in Valley Forge, PA. As a Canadian visiting Pennsylvania, but being familiar with the O.J. media blitz and news about this book, I found it interesting to observe the faces of the people in the room as Kampmann described his passionate belief that this book has its place. Many showed a hint of distaste--not necessarily because of the decision the publisher made to tackle such a sensitive issue, but perhaps more because O.J. Simpson's theoretical 'confession' was being told at all, and in such a shocking way. Kampmann's connection to the Goldman family and to seeing that a certain subtle justice was served by publishing If I Did It seemed apparent in some of his speech, and one could only admire that he saw the people and emotions behind the book and not just dollar signs. Certainly, this story/confession/non-fiction work would have been told eventually, and I can relate to the emotion surrounding the murder of a loved one and to wanting a sense of justice. My youngest brother Jason Kaye was murdered in Edmonton in January 2006. Since around 2000, he had lived a troubled life of alcoholism and mental illness, making him an unstable and unreliable employee. Without a job, he quickly found himself out on the street. But Jason had a heart of gold and a wacky sense of humor. And this kid was amazingly brilliant with a computer! He was only 28 when he was beaten and left to die in a cold, dark alley. His murderer has not been identified or found; he will probably never be found. I truly empathize with the Goldmans. No none wants to feel that a murderer has gotten away with the crime. Or even worse, bragged about it or profited in any way from it. The Ron Goldman Foundation for Justice was set up to "empower, inspire, motivate and assist those people that are victims of crime" and "positively impact the lives of these survivors who start each day with pain, grief, trauma and injustice". This book, O.J. 's alleged confession, was their way to ensure that any profit would benefit other victims. Good for them! Believe me, murder affects people in different ways, even the strongest of people. People who know me would say I'm pretty levelheaded and strong--stubborn even--but I had an extremely hard time leaving my house after my brother's murder. I lived in the same city but far from the rough east end where Jason had died. Yet, I had problems facing people and constantly felt anxiety and panic because even my neighborhood, which was far removed from Jason's world, didn't feel safe anymore. Although I didn't have the resources to set up a foundation, I found my own way to make some sense of a senseless death, which is what I believe the Goldmans are trying to do. My brother read one of my novels--and only one. Whale Song. I had given him a copy of the original 2003 version shortly after it was released. I found that copy in his room when I went to clean it out. The pages were stained and worn, the cover dull in places. But that book was the most wonderful, beautiful thing I saw in that dingy room. It meant that my brother, throughout all of his downs and being homeless and moving from shelter to street to shelter, had kept a fragile grasp on at least one possession that meant something to him. Seeing that battered, bruised, worn copy of Whale Song was a gift. For me. And I value it. In response to Jason's murder and finding my book, I have dedicated the new, improved, expanded version of Whale Song to my brother Jason. You will read about him in one of the front pages, and I am permanently donating a percentage of my royalties to the 3 organizations that did their best to help him. Hope Mission, the Bissell Centre and the Mustard Seed Church are doing what they can to make a difference--to combat addictions, homelessness and poverty. Of course this won't bring my brother back. Neither will the Goldmans' book bring back their son. But out of grief and despair can come the most defining moments of clarity and hope. And we all deserve to find that. Self-Publishing that Works FOR You! Today was officially Day 1 of the 8th Annual Express Yourself...Authors' Conference, sponsored by Infinity Publishing, and I have to share some of what I observed and learned. First, I feel I should clarify that I was recently published by traditional publisher Kunati Books, a new company based in Ontario, Canada, with offices in Florida, US. Kunati has made it very clear that they wish to support my endeavors to help other authors and they know that I am particularly passionate about self-publishing, since I originally self-published 3 very successful titles, and not with Infinity (sorry, guys!). Publishing companies like Kunati make an author's journey far more satisfying, and I must thank them for this support. That being said, I must also thank Infinity Publishing for allowing me to be a small part of their journey. I feel honored to be part of this conference and share my experiences with other authors. I have gotten a true sense of "family" with these Infinity authors, employees and the management, and they have extended this to many authors published by other companies, including myself. They have all made me feel extremely welcome and valued. Thank you! After breakfast, Tom Gregory, President of Infinity Publishing, welcomed the conference attendees, and I found him to be genuinely interested in not only the success of his company, but the success of the authors--ALL authors! You don't find that often. I never met the President of the other self-publishing company I toured. :) One thing that impressed me with Infinity is the expense that this publishing company puts into having an event that benefits their authors and other publishers' authors. They have made the Express Yourself...Authors' Conference affordable for any author. I was also impressed with Infinity's ability to get top-notch speakers to present at their conferences. I have been receiving Jerry D. Simmons' newsletter for a few years now and finally got to meet him. It is awesome to put a face and voice to a name and newsletter one receives via email. :) Other guest speakers were Dan Poynter, Penny Sansevieri and Brian Jud, who are big names in book marketing. Infinity also managed to entice Dave Lieber, an award-winning columnist, and Eric Kampmann, publisher of the controversial O.J. book If I Did It: Confessions of the Killer by the Goldman Family. I'll go more into what these speakers talked about as soon as I have more time. I am attending the 8th Annual Express Yourself...Authors' Conference, sponsored by Infinity Publishing. I was very honored when the Special Projects Director John Harnish asked me if I would take part on a panel, and since one of my goals is to give back to writers--particularly to new authors--I was thrilled. Plus, I've never been to PA before. I left Edmonton yesterday morning very early. The flight was uneventful, with a stop in Minneapolis. Haven't been there either, although I didn't see much from the airport windows. :) When I arrived in Philly, I couldn't get over the heat. 90 degrees F. It was about 40 in Edmonton when I left. Tomorrow will be a full day and I'm looking forward to it. Conferences always give me ideas for writing and marketing, and anyone who knows me knows that I am always looking for creative and fun ways to market my books. On Saturday I will be presenting at the conference--on 2 different panels. The funny thing is that I knew about one of them but had no idea about the other. I found out today that when I told Infinity Publishing that they could "use" me in any way that would benefit them and the attendees that they did just that. :) Good thing I love to talk about writing and marketing. I am really looking forward to being able to share some of the things that I have learned along my journey. So for any of you who are writers, I will put together some of my notes next week and post them on my site. For my dear readers, please know that I am always striving to learn more about my craft. There are always new things to learn. I write for 'me' in the beginning, because I have a story that needs to be told. But then I write for you--for every fan who has supported my work in the past and for every new one who discovers me. My goal as a suspense author is to challenge myself with writing a story that is sophisticated yet entertaining, suspenseful yet emotional, and always my best work with enough twists and turns to keep you on your toes. I hope you'll let me know when I succeed. By the way, if you are in the Valley Forge area tomorrow and Saturday, please stop by the Sheraton Park Ridge Hotel and have the hotel come find me at Infinity's conference. Providing I am not in the middle of my panel, I would be happy to autograph a copy of Whale Song, The River or Divine Intervention. I have limited copies available. Yesterday, I visited the Red Deer Chapters and held a book signing during the afternoon. The staff was awesome and very helpful, and the customers were great. I'm quite happy to say we sold out of Whale Song, and I sold some copies of The River and Divine Intervention as well. But as always, it is the customers who truly make my day. They are my reminder of one of the main reasons why I write. A couple of customers in particular stood out, mainly because they took extra time to visit with me and genuinely seemed pleased to pick up a copy of one or all of my books. Some had already read some of my novels. I have to say a special thank you to Guy who dropped by with his wife and two daughters and ended up with the "Cheryl Kaye Tardif collection". :) Guy picked up a copy of The River, his wife Lesley is reading Divine Intervention, and their daughters Kelsey and Danielle are reading Whale Song. It is so nice to see a family who enjoys reading. Reminds me of how my parents, brothers and I all had different books dog-eared or lying face down on a coffee table when I was a teen. A special thanks also to Lorrie and Jodi who bought a copy of Whale Song...I think it was Whale Song. lol We got talking about motorcycles so I was a bit distracted. Lorrie and her husband Miles build motorcycles. E'Ville Twin Motorcycles. What a cool name! Their daughter sells motorcycle clothing and apparel. E'Ville Teez. I can just picture them now...riding on a handcrafted custom Chopper, all decked out in cross and skull bandanas, cruising down the highway under a sunset sky...with a copy of Whale Song propped up against metal. lol "Born to be wiiiiild." Many authors look at book signings and calculate success based on how many books they sold vs. the cost to get to the signing. I view a successful signing as any time I connect with a potential fan and any time I meet existing ones. At Red Deer Chapters I met both, so it was a complete success. Read an excerpt from Whale Song, The River and Divine Intervention. A wonderful member of our online writing community has fallen on very difficult times. Linda Barnett-Johnson, Assistant Editor of Long Story Short, the ezine (http://www.alongstoryshort.net/), has learned that her husband has cancer. They do not have health insurance. They are raising their 4 grandchildren and now neither can work until Karl completes his chemo and radiation therapies. Her writing friends have launched a fundraiser: A Trip to Paris, http://atriptoparis.homestead.com/ where you can take a virtual trip to Paris and donate to the cause. Or you can take a writing course at the Long Story Short School of Writing, http://www.lsswritingschool.com/ and the school’s share will go to the cause. P.S. This is a valid fundraiser. I can vouch for this. The lovely and talented Eva Avila, last season's Canadian Idol winner, is in Edmonton to kick off the Oil Kings hockey game. She will be singing the national anthem and some of her hit songs at tonight's game (Kootenay Ice vs. Edmonton Oil Kings), which starts at 7:30 pm. Today I had the distinct pleasure of having lunch with Eva. We left her hotel (sorry, I'm NOT telling) and headed down Jasper Ave., battling a chilly wind, in search of sushi. Now there's something Eva has in common with my daughter Jessica. They are both sushi addicts. :) Well, we didn't find a sushi place and ended up instead at WOK BOX, where the food has a definite asian/indian flavour. YUM! You're probably wondering what the heck I did to deserve an hour of this busy young woman's time. I think I'm wondering too...lol. Eva and I have been corresponding via email after I contacted her through her MySpace page. But this was the first time we've met. And what a sweet girl! We spent an hour chatting about the similarities between writing novels and writing songs, the challenges of promoting and marketing, and the advantages of online marketing. Then I gave her a limited edition Whale Song mug to thank her, and asked a customer to take a pic. Hey, I needed evidence to show Jessica. Apparently, my "cool-scale" went up a few notches, she told me. And any mom knows how important that is when you have a teen daughter. Eva and I talked about Whale Song, my bestselling novel and a novel that has captured a lot of movie interest. Currently, numerous film companies, including many from Hollywood, are reading it. We've have been talking about the possibility of Eva playing the lead role. I would be thrilled if a film company asked her to audition. The more I spoke with Eva, the more of "Sarah Richardson" I saw in her. Not just her dark coloring, but her spark and spirit. She brought Whale Song with her on the trip to Edmonton, and I was thrilled to hear that. There are two women I can see playing the lead role of 'Sarah Richardson'. Kristen Kreuk and Eva Avila. And isn't it wonderful that they're both Canadian? Order Eva's CD Somewhere Else. Today I got quite the surprise. I was barely listening to an announcement on the radio--91.7 The Bounce, to be exact, and I heard Eva Avila's name come up. It didn't twig completely until they started talking about the Oil Kings game. (I just don't DO sports! ) Then it hit me. 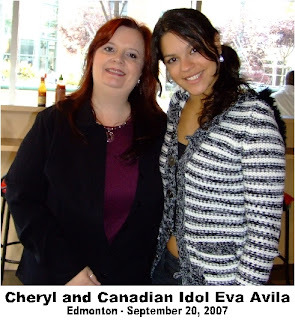 Eva Avila was coming to Edmonton! Now let me backtrack just a bit. Eva and I have been emailing for 2 or 3 months now. In fact, she was very interested in Whale Song, so I sent her a copy. We've been talking about the possibilities of her playing the lead role of "Sarah". I am hoping that when my publisher makes a movie deal that the film producers/directors will at least consider Eva. She fits my image of Sarah, and I think that girl has a ton of talent. Beyond singing. Let me backtrack some more. I've been an Idol fan for a few seasons but it was Eva who actually got me voting more than once a night. In fact on the final vote night I spent 2 hours calling in my vote on speed dial. My Japanese daughter was doing the same thing from our other line. :) Ok, yes, I'm an Idol addict. But really, I was just so inspired by Eva. I finally figured out why tonight. Eva is 19, only 2 years older than my own daughter. Eva has always had a dream. And she has known that eventually it would happen. She is passionate about her goals and dreams and is working so hard to achieve them. She reminds me of someone. Of course, a far younger "me", but all the same, she has the intense dreams of becoming a huge star, just as I have wanted to be a New York Times bestselling author. My dream also started at a young age. But it took me far longer to realize even part of my dreams. Now that makes me feel like a New York Times bestselling author. Thank you, Eva. Order Whale Song on Amazon or your favorite online retailer or bookstore. Cheryl Kaye Tardif - Canadian Suspense Author. I have added some new features. You can now read some frequently asked questions on Whale Song, The River, Divine Intervention, and writing and publishing. I will be adding to them every month. Have you always wanted to ask a writer something? Well, here's your chance! If you have a question you'd like to ask on any of the above topics, please email me. Be sure to check out my new improved website and sign my guestbook! There is so much to explore. Two nights ago, I was very honored to attend a book club meeting held by 7 lovely ladies (Bev, Anne, Eve, Isabel, Gloria, Nancy and Joyce) in west Edmonton. It started at 7:30 and went until 10:00. I had a blast...especially since I was the 'guest author'. They had just finished reading Whale Song. The first order of business--food. Hey, what's a good book club without good treats? And I tell you, these ladies know how to put on a spread. Crab quiche, made specially because of the ocean theme of Whale Song. I asked if we were having whale sandwiches next...hehe. Nope, but fresh veggies and strawberries, salsa and chips, cheese and crackers, chocolate, cashews...wine (darn, I don't drink!)...coffee. Why does book club food taste so awesome? We chatted about traveling as one of the ladies is off to Paris today or tomorrow and another is heading for Madrid. I told them I was going to Pennsylvania, but somehow that just doesn't compete with Paris and Spain. I am always very excited (and just a tad bit nervous) when attending book club meetings. After all, I expect them to be honest about their thoughts and reactions. The first thing they did was a thumbs up/thumbs down vote. I was told that doesn't often happen. They began telling me how much they loved Whale Song and many of them said they cried. In fact, I was encouraged to give out packages of tissue with the book. Strangely enough, I have thought of that idea often. The conversation around Whale Song was great! One woman started telling me about one of her favorite parts and she started crying. Next thing, we were all blinking away like crazy and talking about Whale Song. They asked a ton of very thoughtful questions, about the book, writing, my life, living on the Queen Charlotte Islands, native relationships, getting published. I wasn't surprised to hear that many of them really loved the native grandmother Nana. What I found most interesting was when one of the ladies shared how she thought the story around the mother (Daniella) and her illness was going to go in a certain direction, and that all the clues and foreshadowing could lead to that conclusion. And she's right! Yet, I had never really thought of it...probably because I knew exactly where it was all leading. As a writer, I find it very satisfying to learn that I have delivered a twist, consciously or not, that works. The ladies had me sign their copies of Whale Song and then they bought The River and Divine Intervention, which I had on hand for a special price. In the end, I left feeling exceptionally inspired. It is one thing to write a book and know people are reading it; it is another to actually meet your readers. I have found that being a guest at a book club meeting is a wonderful way to see what people like and don't like. No matter how many industry reviews I get, there is nothing better than being reviewed by avid readers. Read an excerpt from Whale Song. Reviews are just 'swimming' in for bestselling author Cheryl Kaye Tardif and her "compelling" novel Whale Song. "One of the best books I have ever read..."
"Have a tissue ready.... this book is a real tear jerker." "Whale Song is "elegantly written". Read these reviews in full and many more! Over the years, authors who wanted to promote their books directly to the public had one main option; you had to physically travel across the country conducting book signings and readings in various bookstores and praying that people would show up. This meant spending money on flights, hotels, transportation and meals. This traditional type of book tour is expensive and very few publishing companies are willing to pay for them. But now, authors have a new method of ‘touring the world’―the virtual book tour. Virtual book tours (also known as virtual author tours, guest blogging, blog tours, or VBTs) are a simple concept. The author tours various blogs and sites that pertain to a theme in the book or to writing in general. This way, you can potentially reach thousands of avid readers each tour day from the privacy of your office or home. The goal of marketing your book is to expose it to as many people as possible in an exciting, cost-effective and entertaining way. Guest blogging can achieve that goal. Most blogs are archived, so your post becomes permanent and often viral, spreading from site to site. That is leverage. You are in essence leveraging your internet presence and duplicating yourself with every VBT stop. Your blog tour is working for you even while you sleep. Try doing that at a bookstore signing! Read Cheryl's article Authors Tour the World with Virtual Book Tours on John Kremer's Book Marketing site. Canada has another sensational singer destined for great things--Brian Melo of Hamilton, Ontario. Brian beat out Jaydee Bixby from my home province Alberta (Drumheller, in fact, which is spectacular and known as 'dinosaur' country). While Jaydee has the voice and mannerisms of a blond Elvis, Brian has the heart and soul of a true storyteller. His song choice has been dead on and the evolution of his personal and professional growth on stage resulted in Brian winning the hearts of Canadians (mine included) and the final most coveted prize--the title of Canadian Idol. Congratulations, Brian! I know I'll be buying your album. Some of this year's Idol mentors were: Paul Anka, Kelly Clarkson, Enrique Iglesias and Bon Jovi. The two hour finale also showcased the first ever live Canadian performance of Bon Jovi, a band I have loved for years. And I just have to say: Jon, you are looking as yummy as ever! :) Bon Jovi sang Lost Highway from their new (same name) album. They followed this with one of my favorites, It's My Life. Released in 2000, it was their first single in 5 years. And I tell ya, I sure missed them! And for those who may not have heard or read, Eva has a copy of Whale Song, which she'll be reading when she gets a break. I can't wait to hear her thoughts. As mentioned in My Book, The Movie, Eva is someone I can definitely see playing the role of twenty-something Sarah Richardson when they make Whale Song...the movie. So, if there are any producers/directors out there looking to give Eva her first break in the movie biz, I have the story and you can contact my publisher at Kunati Books. Tonight, the top 10 performed and I have to say, they sounded pretty good. I think many of them will be going on to immediate careers, especially Carly Rae Jepson, who was my personal favorite this season and who was voted off in the top 3. Congrats to all the contestants for following their dreams and dreaming big, something I am known to say often when giving advice to aspiring authors. Brian, you dreamed BIG and you made Canada proud! I can't wait for your first CD. Tomorrow morning, Brian Melo's first single All I Ever Wanted, written by Chris Perry and Nicole Hughes, will hit the radio waves and take Canada by storm. I sense a #1! For more information on this year's Canadian Idol competition, please visit Canadian Idol on CTV. Whale Song review: "Fabulous Book!" "Fabulous Book! "Whale Song" is a fabulous book! I could not put it down. The descriptions of the characters and the setting are so well written you feel like you are in the book too. Have a tissue ready.... this book is a real tear jerker. I look forward to reading more books by Cheryl Kaye Tardif!" Today I was writing at my new haunt--the Denny's on 50th St and 25th Ave. My usual writing place--the Cappuccino Affair--may be sold soon and the owner has kind of lost interest, which means that the menu has dwindled to next to nothing and sometimes he isn't even open. Since I like to write for 6+ hours, I need a place where I have a few things to choose from for lunch or supper. A few weeks ago, I went into Denny's Restaurant and spoke with the owner. He was extremely accommodating, allowing me to come in and write any time and for as long as I want to--even if all I order is coffee. Well, he's got nothing to worry about there. I happen to like way too many things on their menu! And they're open 24-7! I have two favorite tables already, and the staff is getting to know me and I, them. Some great young people work there! Sogand has greeted me every day that I show up as if I'm her favorite author, yet I know she hasn't read any of my books. So today I brought her a signed copy of Whale Song as a thank you because she had shown an interest in my work and she always made sure I got my table as soon as it was available. Today, however, my favorite tables were full, so I sat at a different one (there are only 4 with outlets for my laptop). Then I set to work on Divine Justice, book 2 in the Divine series. I tried to return to my game, but then they began talking about a subject that filled my ears. Books and reading. Okay, could you possibly dangle more carrots in front of me?! Apparently the other woman knew someone who had just found a love for reading and she was excited for him. I thought she was talking about one of the boys at first. She mentioned some book titles and authors' names, and then I made carrot cake out of all the carrots they were dangling and turned around. "Excuse me," I said. "I'm sorry..." I saw the look on their faces. I think they thought I was going to complain about noise or something. "...I couldn't help but overhear your conversation. I'm an author." Eyes lit up. I let out a breath, relieved that they weren't going to snarl at me for having large ears. I discovered that the new avid reader was actually the one woman's husband. So I mentioned that The River is my bestseller with men. After a brief chat, I turned back to my work. It's really hard to NOT listen when someone is talking about you literally behind your back. lol I heard the moment they discovered my name. "Her name's Cheryl too," someone said. Before they left, I heard that one of the boys wanted to ask me a question. They tried to encourage him to come and ask me, but he was too shy. I set my glasses aside and waited. A second later, they all appeared at my side. The older of the two boys asked me his question: "Why did you call it Whale Song." I smiled. And then I told him why. Read Amazon reviews of Whale Song. On Internet Voices Radio, Cheryl talks about Whale Song and book promotion with host Lillian Cauldwell. Go to my Downloads page and you can listen to my interview with Lillian Cauldwell (Aug. 15).